Preheat oven to 180°C (350°F). Place the rice and water in a small saucepan over medium heat and cook for 10 minutes, or until the rice is tender. While the rice is cooking, place the lemongrass, ginger, garlic, coriander and kaffir lime leaves in a small food processor and process until finely chopped. Place the cooked rice and lemongrass mixture in a medium bowl with the coconut and mix to combine. Spoon the rice mixture into the cavity of the chicken and secure the legs with kitchen string. Pour the extra water, fish sauce and brown sugar into a roasting pan and stir to dissolve the sugar. Place the chicken, breast-side down, in the pan and roast for 40 minutes, basting with the pan juices every 15 minutes. Turn the chicken and roast for a further 40 minutes, basting every 15 minutes, until the chicken is cooked through. 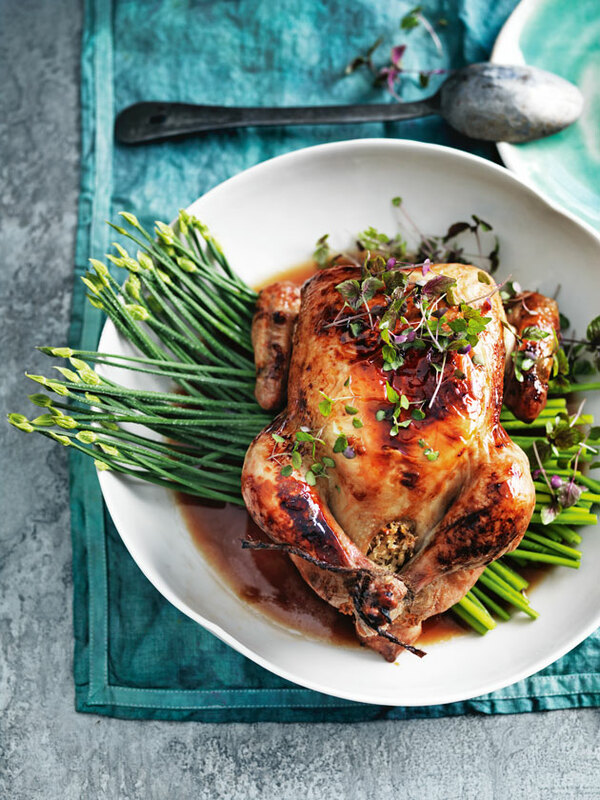 Pour the lime juice over the chicken and serve with the garlic chives, pan juices and micro herbs. Serves 4.